This article lists Best Free WebP to GIF Converter Software for Windows. Using any of these freeware, you can convert WebP images to GIF, or you can even convert a whole WebP images folder to GIF at once. Also, you can convert GIF to WebP in a similar manner. In many of these software, you can even create animated GIF using WebP images. For this purpose, you can customize many parameters including delay rate, size of each frame, frame order, alignment, etc. As most of these WebP to GIF converters are primarily image editors. Hence, you can manipulate WebP images before converting them to GIF format. These software provide general as well as advanced editing tools, such as rotate, resize, crop, image filters, drawing tools, text, watermark, basic color adjustments, etc. Apart from WebP to GIF, you can also convert WebP to JPG, WebP to PNG, and other supported formats like BMP, TIFF, ICO, etc. Picosmos is my favorite freeware to convert a WebP image to GIF. It provides flexibility to batch convert WebP to GIF. You can also create an animated GIF using WebP images. XnConvert is also a good choice to convert WebP to GIF. It is primarily an image converter which supports a good range of formats. It also lets you edit WebP images prior to the conversion process. 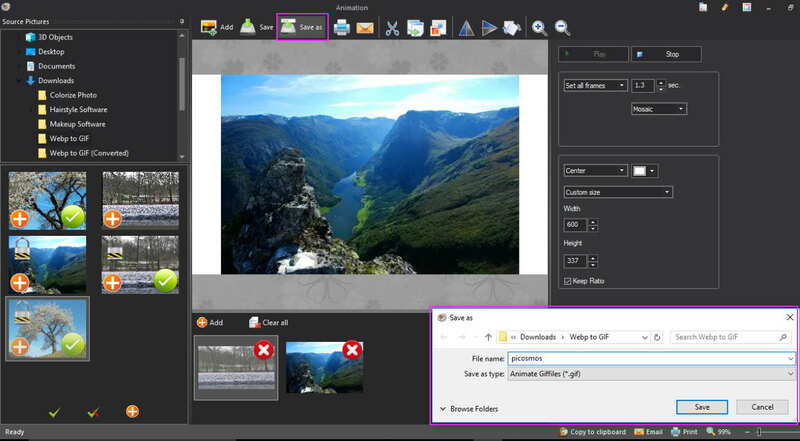 Picosmos is a free image processor software for Windows. As you launch it, you will see various tools which you can use for editing and combining images, creating animations, screen recording, making page designs, etc. This freeware can also be used to convert WebP to GIF. Open Batch module to batch convert WebP to GIF. Just add a folder containing WebP images, select desired images, and click on Convert button (present at left panel). Now, you can choose output format as GIF, customize output resolution, quality, and output folder. Using Editor tool, you can first modify a WebP image (for editing tools, check here) and then save it as a GIF image. Using Combine tool, you can combine multiple WebP images to form a collage. After that, you save the WebP collage as a GIF image. From Animation module, you can create an animated GIF using WebP images (described below). This WebP to GIF converter provides a great feature to create an animated GIF with WebP images. To do so, open Animation module and add desired WebP images using its inbuilt file explorer. Now, from the right side of the interface, you can adjust frame, duration, alignment, customize the size for each frame, etc. You can play the GIF to have a preview of the output. To save the GIF, use Save as option. An animated GIF with WebP images will be created. In the similar manner, you can create animated GIFs using other images as well. 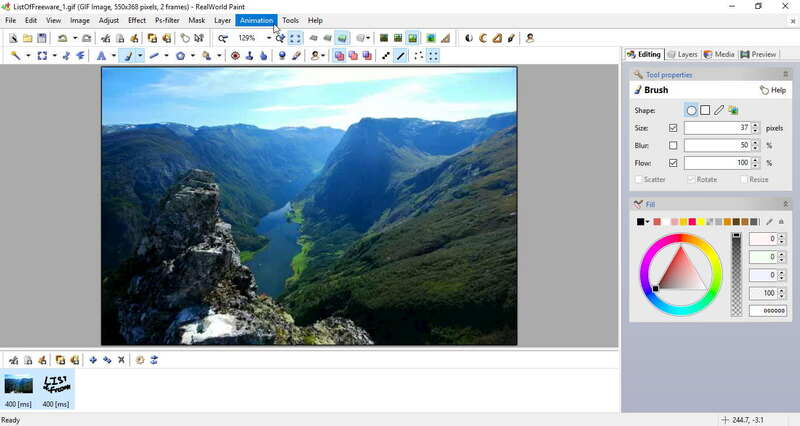 Picosmos is a great image editor for Windows. It supports a wide range of image formats including PNG, JPEG, ICO, RAS, TGA, WMF, RAW, etc. XnConvert is an image converter software for Windows. Using it, you can convert WebP to GIF, or even convert a folder of WebP images to GIF. Simply add individual WebP images or a folder of them in Input tab. If you want to edit WebP images, go to Actions tab. Here, you can make desired adjustments to images like resize, crop, rotate, add filters, add watermark, set DPI, etc. Now, go to Output tab and select output format as GIF. You can enable interlaced and GIF 87a parameters for resulting GIF. Select desired renaming pattern, output folder, preserve metadata, etc. and click on Convert button. From Status tab, you can view log information of WebP to GIF conversion process. XnConvert can be used to convert a variety of file formats including TIFF, GIF, JPG, PNG, RAW, CSV, ICO, PGM, PDF, etc. It is a very user-friendly file converter software. Paint.Net is one of the most commonly used image editing software. It can be used for various utilities including generating textures, editing SVG files, inverting picture colors, etc. This can be your another alternative for a software to convert WebP to GIF. Using Paint.Net, you can convert WebP to GIF image or even convert WebP to animated GIF. But, there is a trick to that. You will need additional plugins to achieve either of these two goals. Let’s see how. This can be done by simply opening a WebP image and using Save as option to convert it to GIF. But, as it doesn’t inherently support WebP format, you need to download WebP Filetype plugin. After that, extract the ZIP folder and copy all DLL files to FileTypes subfolder in the installed Paint.Net folder. As simple as that. Create a canvas with desired width and height. Go to Layer > Import From File option and choose a WebP image (or any other supported image format). This way, you can add multiple WebP images to create an animated GIF. You can also create new layers by using drawing tools. Now, use Save as option and choose output format as animated GIF. You will be then asked to specify counts and delay (in ms). After specifying these parameters, an animated GIF with WebP photos will be created. Paint.Net is a convenient option for its regular users to convert WebP image to GIF image or WebP to animated GIF. IrfanView is a popular image editor for Windows. It can be your another alternative to a freeware to convert WebP to GIF. But like Paint.Net, it also doesn’t support WebP format natively. So, you need to install an additional plugin in order to open and edit WebP image in IrfanView. To download the required plugin, click here > IrfanView Plugins. After installing the above plugin, open a WebP image. You can edit it prior to converting WebP to GIF. After that, use Save as option to save WebP image in GIF image format. Another alternative to convert WebP to GIF is by using File > Batch Conversion option. Here, you can add multiple WebP images and convert them to GIF at once. While doing so, you can customize rename pattern and output parameters like GIF quality, preserve metadata, save GIF with a transparent color, etc. Using Advanced Options, you can even edit added WebP image by utilizing tools like crop, resize, rotate, flip, color correction, watermark, etc. So, this is how you can make use of IrfanView to convert WebP to GIF. Similarly, conversion of GIF to WebP is also possible. For this, you get to choose preset type (icon, picture, drawing, etc. ), quality, additional tuning, etc. GIMP is another popular image editor which can be used to convert WebP to GIF. Like some other software, this one too requires an additional plugin to support WebP format. Simply install the required plugin after downloading it from here > GIMP WebP Plugin. The conversion of WebP to GIF is similar to many other software. Simply open a WebP image, edit it as required, and use Export As option to convert it to GIF. You can use the same method to convert GIF to WebP image. Like few other software, it also lets you create animated GIF using WebP images. You can import multiple WebP images as layers. Also, it lets you add multiple layers by drawing them or using different image formats (JPG, PNG, ICO, BMP, etc.). You can then use Filters > Animation options to customize output GIF. To know more about how to create an animated GIF in GIMP, check here > Simple Animations in GIMP. After creating animated GIF using WebP images, go to File > Export As and choose output format as GIF. In the new dialog box, enable Animation option and set delay between each frame in milliseconds. You can also add GIF comment and enable interlacing, loop forever, etc. options. GIMP is a feature-rich image editor. It supports a wide range of formats including JPG, PNG, BMP, TIFF, SVG, ICO, WMF, etc. Chasys Draw IES Converter: Using this tool, you can simply convert WebP to GIF. Not just one, you can convert a folder of WebP images to GIF. The process of doing so is pretty simple. Add a WebP image folder, select target GIF folder, customize renaming options, choose target file format as GIF, customize resizing options, select effects and transformations (rotation, processing), and select other options like remove EXIF tags for Geo-location, etc. As you specify these parameters, you will see Conversion Summary containing selected input parameters. If you want to change any of the input, click on Back; else, click on Start button. The WebP images will be converted to GIF images. Chasys Draw IES Artist: This tool lets you modify WebP images before WebP to GIF conversion using its general as well as advanced editing tools. Drawing (hand, brush, pencil, text, shape, eraser, magic wand, pen and path, etc. ), basic image adjustments (brightness, contrast, etc. ), transformation (rotation, flip, etc. ), etc. tools are available in it. It lets you import another WebP or another image as layer too. There are different panels of layers, color palette, actions history, preview, etc. which makes the editing task easy. After editing the image, you convert WebP to GIF using Save as option. To know more about its editing tools, check here > WebP Editor. Apart from WebP and GIF, it supports a good range of image formats as input and output including JPEG, PNG, ICO, CUR, BMP, TIFF, etc. Chasys Draw IES is a feature-rich image processor. You can use it to create static/animated cursors, create object animation, record video, etc. Pixillion Image Converter, as the name suggests, is a dedicated image converter for Windows. It is free for non-commercial purpose only. To simply convert WebP to GIF, add one or multiple WebP images and choose output format as GIF. You can also edit the WebP image using tools including Resize, Flip, Rotate, Watermark Text, and Watermark Image. Finally, click on Convert button for WebP to GIF conversion. After adding WebP images, select the files you want to combine into an animated GIF. Select output format as GIF and click on Combine tool present on its interface. Now, in new Combine Images window, you can reorder image sequence in the resulting GIF. At last, click on Combine images button and select output name and location. That’s it. So using this freeware, you can convert WebP to GIF and even create an animated GIF by combining multiple WebP images. Pixillion Image Converter supports a good range of file formats for conversion, including JPG, BMP, DOCX, PDF, ICO, TIFF, etc. RealWorld Paint is another one of WebP to GIF converter in this list. Using it, you can convert WebP to GIF, or you can also create an animated GIF using WebP images. To simply convert a WebP image to GIF image format, open the image, edit it if you wish, and use Save as option to convert it to GIF. Click here to know more about its editing features. Click on Create module from the main interface and choose either of New Raster Image or New Vector Image options accordingly. Specify parameters for canvas including width, height, background color, and resolution (in DPI). Go to Create menu > Create animation option and choose a number of columns and rows. Now, import WebP images to individual frames of the animation by going to Layer > Import Layer. You can then edit and annotate images as per your requirement. You can view all frames of animated GIF at the bottom of the interface. From there, you can customize animation speed. Or, you can go to Animation menu and use options like change animation speed, loop count, insert frame, duplicate frame, etc. You can watch the real-time preview of the created animated GIF from Preview tab present in the right panel of the interface. After editing the GIF, go to File > Save as to save the animated GIF. You can save individual frames as GIF image too. Similarly, you can create an animated GIF using images in other formats like JPEG, PNG, BMP, etc. RealWorld Paint is another nice image editor and WebP to GIF converter. You can know more about it here > RealWorld Paint Review. WebPconv is a straightforward WebP to GIF converter for Windows. Apart from WebP to GIF, it also lets you convert WebP to JPG, PNG, TIFF, or BMP. To convert WebP to GIF, simply move to Decode tab and add one or multiple WebP images. Now, click on the menu button (at the top right) and choose output format as GIF from Decoding options. Other options that you can customize are enable filter, transparency effect, dither strength, etc. After customizing these parameters, click on the run button to start WebP to GIF conversion. In a similar way, you can convert WebP images to other supported formats like JPG, PNG, BMP, etc. too. To convert GIF to WebP or PNG/JPEG to WebP, use Encode tab. You can customize preset type, compression method, quality factor, etc. parameters for output WebP image. WebPconv is a dedicated software to convert WebP to other image formats and vice-versa. It’s easy to use and has a simple and intuitive user interface. File Converter is a shell extension for converting multimedia formats. 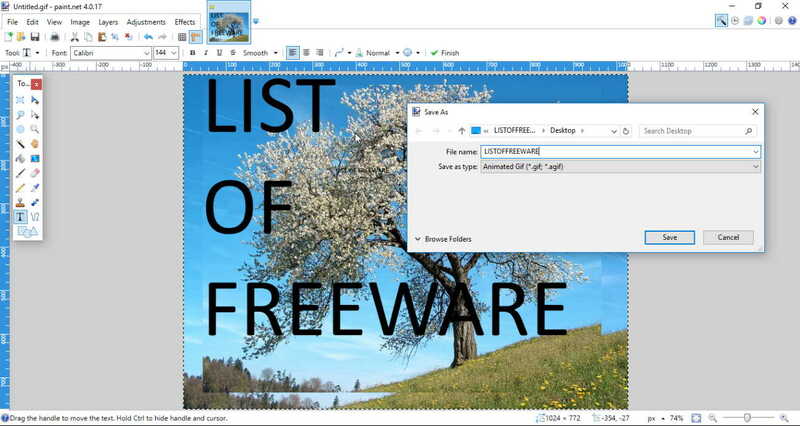 After installing this software, it will be added to the context menu of files of supported formats. These formats include WebP, PNG, JPG, FLAC, AAC, OGG, MP3, WAV, MKV, MP4, AVI, GIF, PDF, etc. To convert WebP to GIF, simply go to a WebP image and right-click on it and click on File Converter > To Gif from the context menu. If you want a low-quality GIF, click on To Gif (low quality) option. Likewise, you can convert other images formats too. File Converter is the simplest tool to convert WebP to GIF in this list. It makes the whole task of file format conversion pretty simple. Webp Bulk Image Converter is another simple software to convert WebP to GIF or other formats including JPG, PNG, and BMP. Simply browse a folder containing WebP images, click on GIF format from its interface, and then click on Converto button. All WebP images from the added folder will be converted to GIF at once. You can also view log information and number of converted and not converted files.